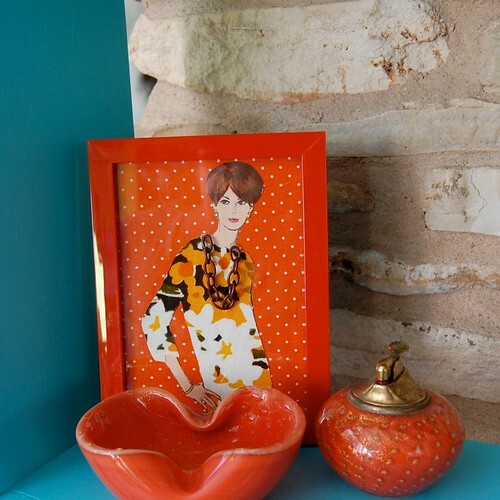 A million and one years ago my friend Tina Sparkles made art out vintage patterns. 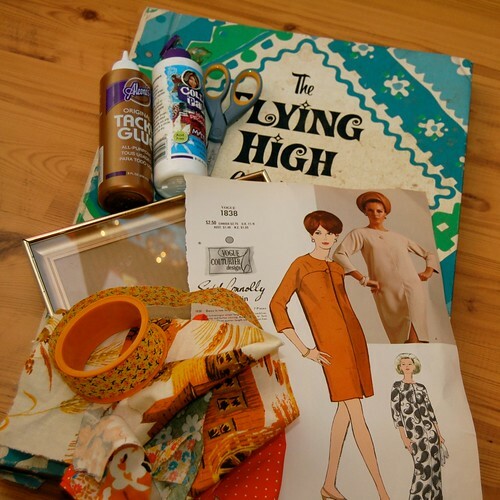 A year or so ago I found a vintage Vogue pattern book at an antique mall and it has sat on a shelf in my studio until recently when I started thinking about Tina. I have one of her pieces of art hanging in my bathroom. The piece is a pattern from the 40’s attached to a hand painted canvas and adorned with glitter. 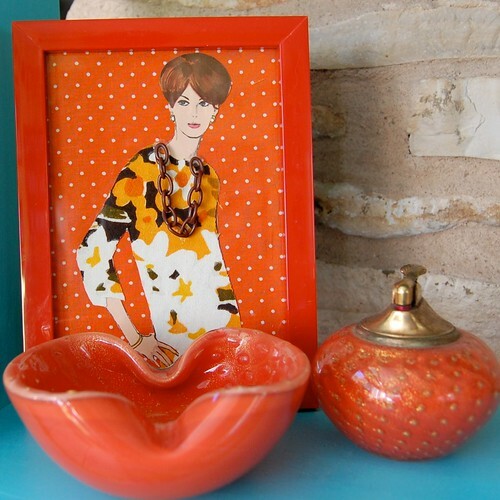 Looking at this piece and remembering my own book of patterns I had the sudden urge to create my own version in fall colors. I gathered an assortment of collage supplies like wallpaper, Collage Pauge, fabric, picture frames, scissors and Tacky Glue. At this point I was not sure where my fall themed arty journey was going to take me. After I chose a lovely lady to work with from the pattern book I cut her out. I then held her to a window and traced the outline of her dress onto a sheet of white paper. I cut out the paper dress and traced that onto a piece of vintage floral fabric. 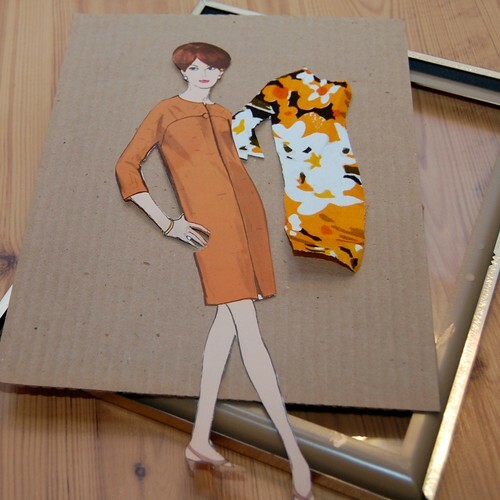 I cut the fabric dress out and attached it to my paper doll using Tacky Glue. 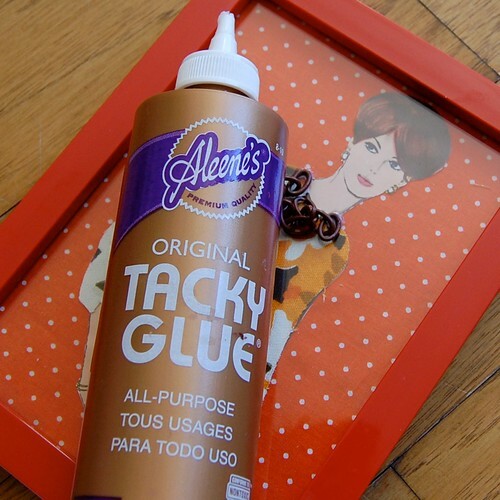 Also using Tacky Glue I attached a piece of white and orange polka dotted fabric to the backside of a picture frame. I then adhered my girl in her new dress and sealed up the frame. I liked the idea of adding some dimension to the glass side of the picture frame as well. 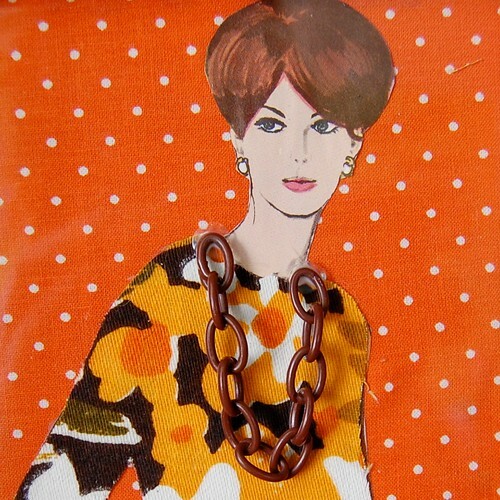 Using Tacky Glue and a bit of vintage plastic chain I gave this brunette beauty a smashing new necklace. I’m thinking of making a whole series in fall themed dresses to adorn the house with this November. What do you think? I usually go straight from Halloween to Christmas, but for these collages I might make an exception. Posted November 3, 2011 & filed under Art, Home Décor Crafts, I Love to Create, Thanksgiving. This is such a great idea for all those scraps of fabric I can't bear to throw out! This is fab!!! You absolutely should make a whole series!!! …then show us! o wow!! this is an amazing idea!! !